Mostly lost and occasionally found yogi, teacher, artist, recovering yoga studio director, big-picture thinker, community builder, and all-round problem solver, I have always had trouble reading maps. I haven’t let this stop me from navigating. So, get in! We’ll figure it out together and have a big adventure along the way. On the advice of some very wise people at Tranquil Space, I picked up Julia Cameron’s book The Artist’s Way: A Spiritual Path to Higher Creativity, (Penguin/Putnam, 1992) and I am now recovering the joy and spontaneity that my creative life had been until I got in the way of myself. And I’ve come to see that to become found, you really must be lost in the moment. I have also come to see all of my life as one big creative project. Practicing art and practicing yoga demand that you turn yourself off — get yourself out of your own way. My art had become all about ME. What did I think? What did I want to say in this painting? What did I think was interesting? It’s just like how a pose becomes all the more difficult when I find myself thinking about what I look like or how much better I am at this pose now than I was in the past. The lesson is just to be in the moment. Just practice. Come to the mat and find it. I am treating myself this morning to finding and reading other blogs and I came upon your site. Lucky me. Will be happy to follow your journey. Belated thanks for bringing the yummy muffins to our last class. I so appreciate all your good tips and help while you were teaching at Pengu. Grace even told me Thursday how much stronger I have gotten and how I have improved since summer..so I push on. Good luck and much success in your new ventures. I miss you all like all get out, but I am enjoying this new phase of the journey. Please take good care of yourself and give my love to everyone. 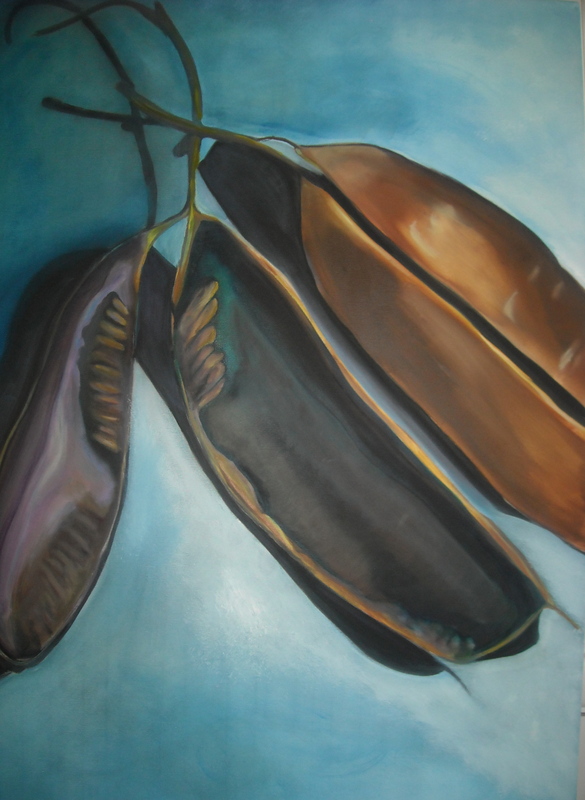 Meg…ur pods may, in fact, b tortured, but they r beautiful. Such a great painting…i hope u r in love with it, for all great relationship reasons of ups and downs! Lol! Thanks, Cyn! Miss you, babe. Hope you get you 18 in this weekend! I heart that last paragraph! Such great advice! You’re awesome, Meg! I’m a big fan of your creative spark! Peyton, you are such a sweet presence at the studio. Love seeing you there and look forward to reading many, many more of your poems.